Jeff Kline, from Indiana University, is the world's foremost expert in Pulmonary Embolism, particularly from an Emergency Medicine perspective. He has been quite active in #FOAMed recently through @klinelab. Below; there is a summary of two of his most recent tweets regarding the approach to the patient with suspected Pulmonary Embolism in the Emergency Department. 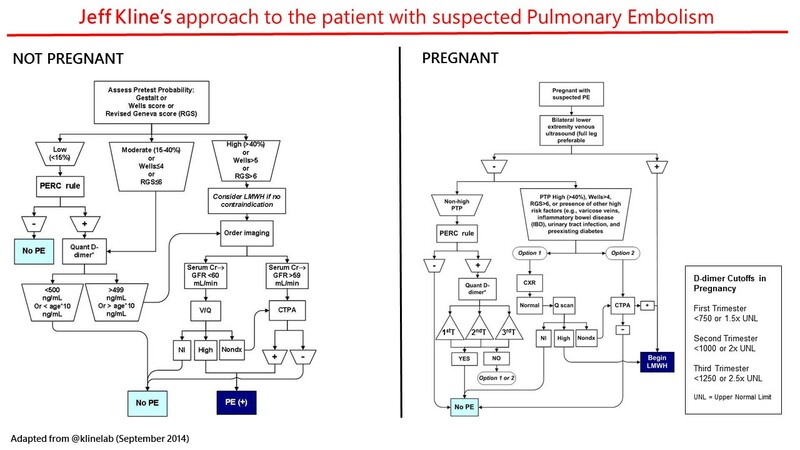 This algorithms represent his perspective about the clinical problem. It is important to note that Kline is using Fibrinogen Equivalent Units (FEU) is his charts, where the upper normal limits is 500 ng/mL (0.500 mcg/mL); instead of D-Dimer Units (DDU) where the upper normal limit is 250 DDU ng/mL.